Thai Slaw Cabbage Wraps–two different ways! 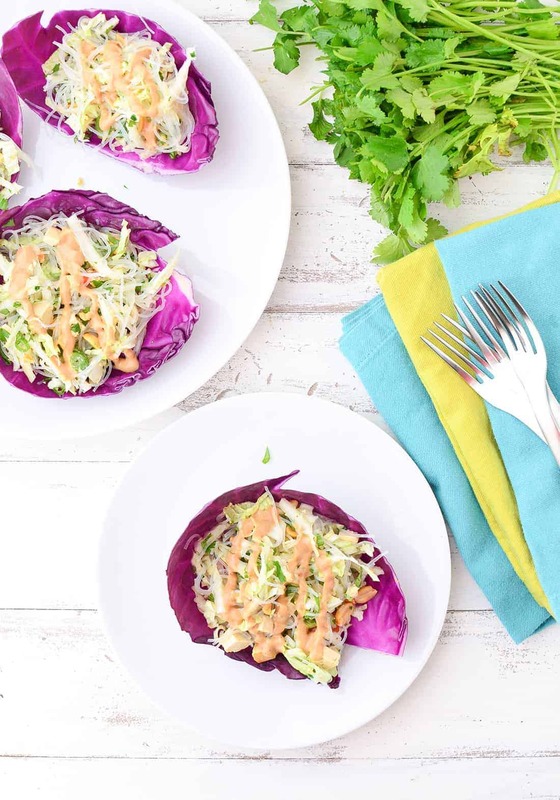 Vermicelli and Napa Cabbage Slaw tucked into red cabbage cups and topped with ginger-peanut sauce. Or rolled into spring rolls and served with a ginger-peanut dipping sauce. Choose your own adventure! What should we call these? Is it a wrap? A roll? A lettuce cup? Ever since dreaming/making/photographing/and now writing this post, I think I’ve changed the name 43 times. We are having a major identity crisis over here, but in the most glorious way. 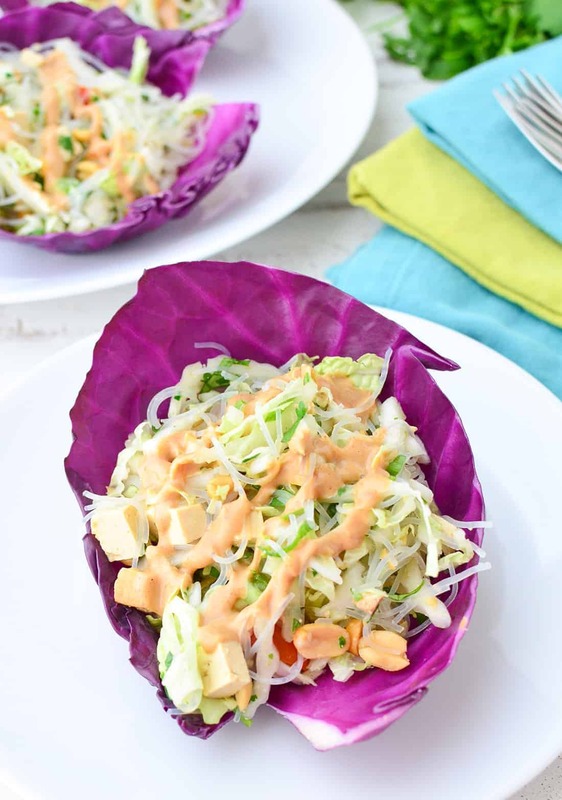 First, I wanted to make a crunchy cabbage cup stuffed with vermicelli slaw and topped with my favorite thing ever —> ginger lime peanut sauce. Those were SO good that I ended up stuffing the leftovers into rice paper rolls the next day for lunch, complete with said dipping sauce. Now I am love with both recipes. At the same time. So instead of choosing- you’re getting both! Make one, make the other, make them all. Either way, the recipe(s) is a total winner. Let’s start with the rolls as that’s what I’m currently eating/dipping right now. First off, I think I would like just about anything stuffed into rice paper. They are so light and refreshing, I am making a mental note to wrap things in tortillas less and into rice paper rolls more. The slaw is one of my absolute favorites, and was the original feature for this post. See what I mean when I say identity crisis on?! First a slaw, then a cabbage wrap, and now we are back to the roll idea. I was first introduced to vermicelli noodles back in elementary school when my parents were on a major vietnamese kick. Thank you mom and dad for turning my 8-year old palette onto the deliciousness of cold vermicelli noodle salad. So, I recreated my go-to dish here: vermicelli noodles tossed with lots of shredded napa cabbage, peanuts, lime dressing and tomatoes (gotta show my Italian roots somewhere). If you haven’t made time to visit your local Asian market, now is the time. I’m lucky that we have a great one a few blocks from our place, and it’s my go-to store to stock up on different types of noodles, curry pastes and spring rolls. Plus, more often than not, it’s less expensive than traditional stores. I bought a package of spring rolls for $1.50, much less than the typical $4 sticker price at Whole Foods. The package of vermicelli noodles that I used here set me back a whopping $0.52. If you’re like me and love the flavor combination of cabbage-peanuts-lime with crunch, then why not try the spring rolls as fresh cabbage rolls? This is my attempt at a heartier lettuce wrap, swapping in red cabbage leaves for iceberg or butter lettuce. 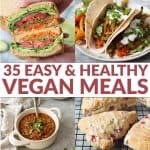 Personally, I love the bitter, peppery flavor and texture of red cabbage but if that’s too much crunch for you, consider substituting traditional lettuce leaves or green cabbage leaves. Or, if you’re looking for yet another way to enjoy this dish (clearly there are several), then thinly slice the red cabbage leaves and toss with the green slaw, lime dressing and peanut dressing. If you were having any doubts about making any of the above versions, maybe the nutrition stats will close the deal. Two different types of cabbage (red and Napa) provide a few grams of fiber, vitamin C, vitamin A, and vitamin K for less than 30 calories a cup. For those of you watching your calorie intake, I recommend doubling (or tripling) the amount of Napa cabbage to get a more nutrient-dense portion. Red cabbage, like broccoli and brussels sprouts, are cruciferous vegetables and contain sulfur containing compounds called glucosinolates that are responsible for the bitter flavor. Glucosinolates have been shown to reduce inflammation, fight bacteria, and prevent some types of cancer. So, pass the cabbage, will ya? Thai Slaw Cabbage Wraps–two different ways! 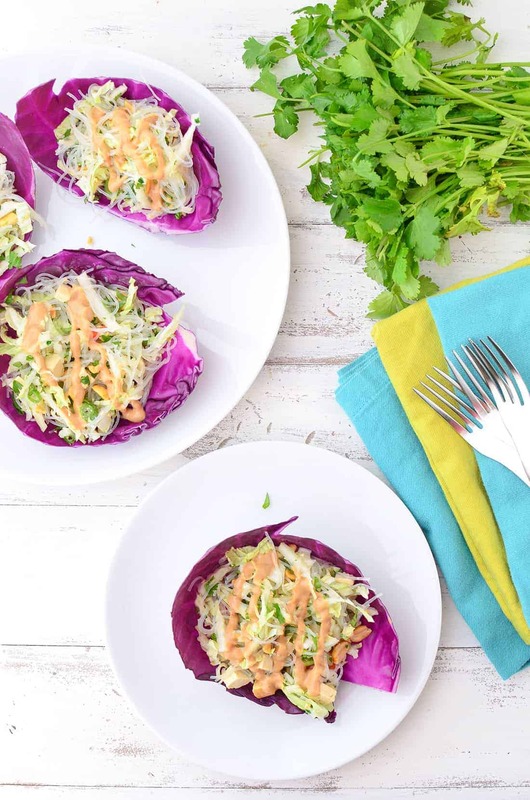 Vermicelli and Napa Cabbage Slaw tucked into red cabbage cups and topped with ginger-peanut sauce. Or rolled into spring rolls and served with a ginger-peanut dipping sauce. Soak vermicelli noodles. Drain, set aside. Place drained vermicelli, shredded cabbage, tofu, scallions, cilantro, tomatoes, and roasted peanuts in a bowl. Heat 2 tbsp., 1/2 tsp. ginger and garlic with ¼ cup water in a sauce pan. Heat over medium heat, until sugar has dissolved. Add a pinch of salt. Remove, stir in 1/4 cup lime juice and let cool. 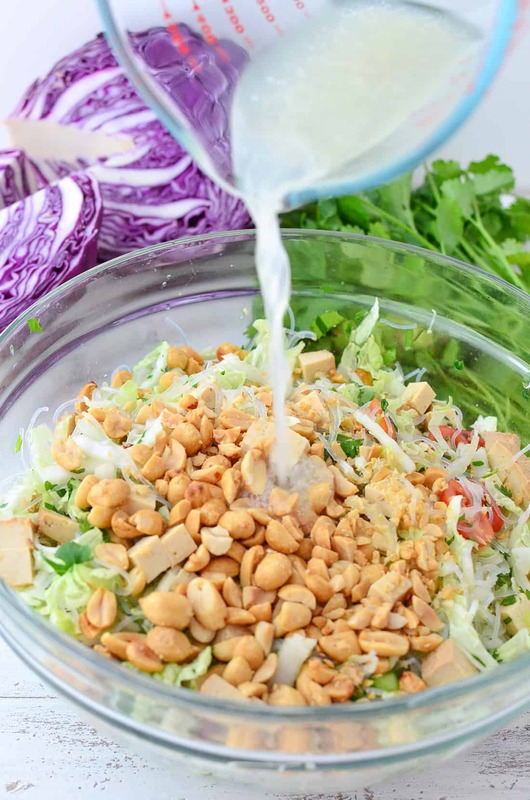 Pour dressing into vermicelli salad and toss. Make the peanut sauce: whisk together peanut butter, 1/2 tsp. grated ginger, soy sauce and brown sugar with hot water to thin. The inner leaves of the cabbage are more tender than the outside. If you want to make this a slaw, thinly shred the red cabbage and add to the bowl. Toss with both the lime dressing and peanut dressing. Serve as a side dish. Don’t want a crunchy bowl? Make them into spring rolls! Make the slaw as directed, but slice the baked tofu into 1″ slabs. 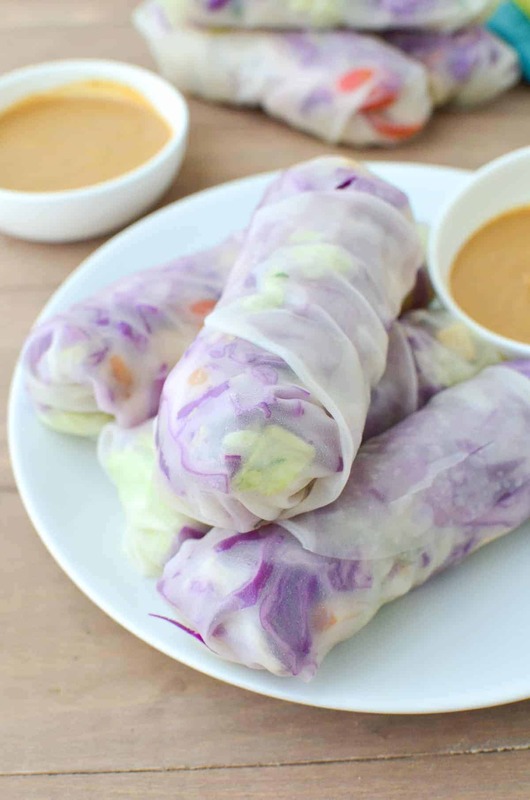 Layer the shredded cabbage, sliced tofu, and napa cabbage slaw on the spring roll wrappers. 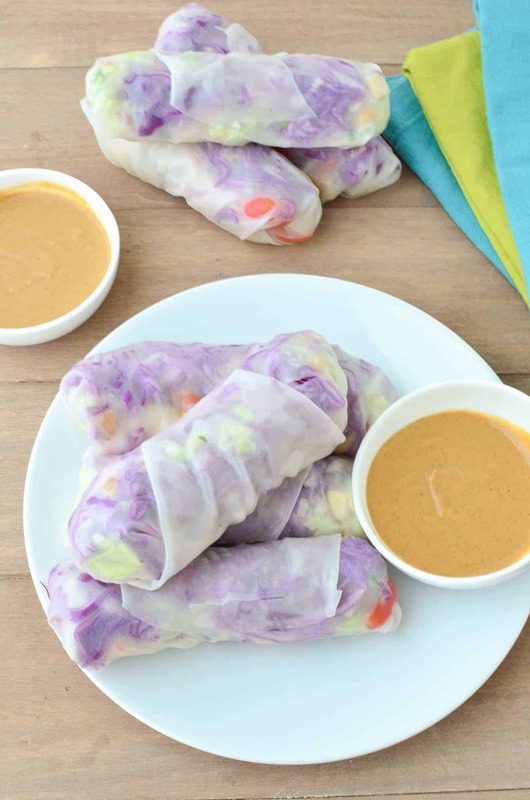 Tightly wrap and serve with ginger-peanut sauce. This looks like a dish I would love! Pinning for menu planning. I haven’t forgotten to reschedule. Promise! There’s a Vietnamese restaurant in our town that serves a similar dish as the wraps. All the veggies/stuffings come on a plate with rice paper and you wrap your own. It’s one of my favorite things to order because it’s delicious AND interactive – haha. Now I can recreate it at home! Yes! That’s what I used to order when I was eight 🙂 It’s the best! I forget what it’s called but it’s amazing!!! I was obsessed with rice paper tofu wraps last summer. 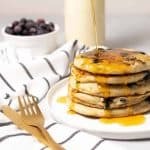 When it’s hot out and you don’t feel like cooking they are so quick and easy. I love them too!